We should totally do an Arlington Only Passover this year! See, the display usually carries a random and limited selection of items (say, Matzo, borscht and marshmallows) that leaves me wondering how anyone could stock up for 8 days of eating with such a limited selection. 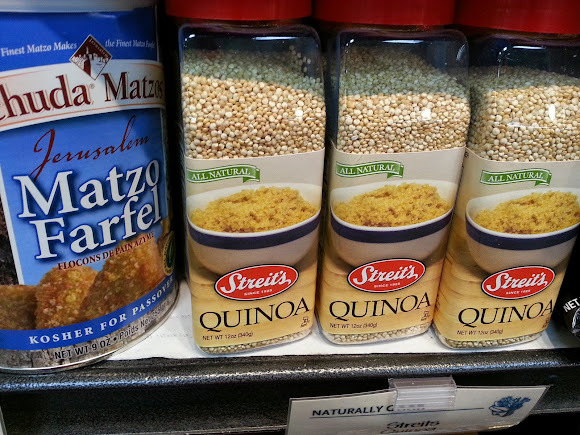 Just across the border in Maryland are stores overflowing with Passover friendly options, from basics like tuna fish and potato chips, to the absurd chocolate breakfast cereal. So I urge Shira, who lost patience with me 3 aisle ago, what if this year we *did* an Arlington Only Passover. That is, stock up for holiday using just what the County grocery stores have to offer. Wouldn't that be fun, interesting and adventurous?! Did I mention that I'm not on the Cooking Team, too? So yeah, I could brainstorm all I want, but at the end of the day, Shira will be the one doing all the cooking. (Can you guess who's captain of the Clean Up Team?) As such, she gets to decide where we shop. So yeah, this weekend we'll almost certainly go to Maryland and live it up. But I'm telling you, one of these years She's going to see my little experiment as an adventure and is going to embrace it. Just not this year.